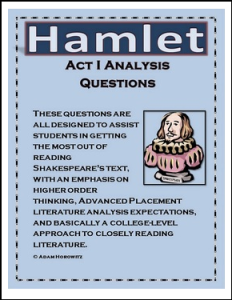 These are questions (and answers) that I’ve designed to help students get the most out of a close reading of Shakespeare’s Hamlet. These were designed with an AP Literature class in mind, but certainly other level courses could benefit from challenging materials. I have been teaching AP Lit for 9 years, have a Masters in Creative Writing, and have had a very successful open enrollment literature program that has been exceeding the national passing rate average (with 50 or more students passing per term). The page numbers correspond to the McDougal Littel Hamlet hardcover, but they are organized by Act and Scene so any copy of Hamlet can still be used to answer the questions.